By Tony Lee and Matt Kemelhar. Navigating Windows in the most efficient manner possible can be seen as wizardry-- it almost seems as if Microsoft tries to make it increasingly more difficult to accomplish simple things. However, there are plenty of very useful tricks and shortcuts built into Windows, the problem is they are not publicized very well. Students in our Ultimate Hacking Courses usually find these Windows tips useful, so we figured we would share them. If you thought “doskey /history” was cool—this is even better and more useful. Function keys help control and recall the command history in Windows. We have noted the most useful keys and their function below. Try them out for yourself. F7 – Graphical command shell history After hitting F7, you can use the arrow keys to scroll up and down through the command history and then use the right key in order to edit the command or hit enter to run the command. The screenshot below shows a graphical command history is presented after the user presses F7. This can be navigated via arrow keys. This is often very useful when running commands whose output extends beyond the 80 character default width of the unaltered command shell. This screenshot shows you what it looks like to expand the window quickly with mode. This is very useful when setting different color shells to indicate different functionality. 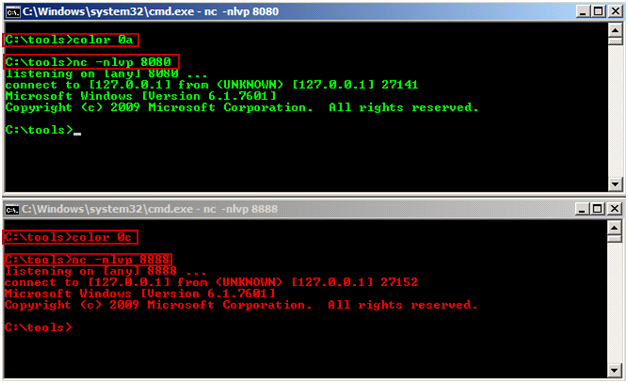 If no argument is given, this command restores the color to what it was when CMD.EXE started. 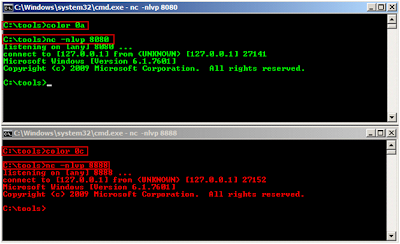 The screenshot below shows two different windows with two different colors with netcat listeners on different ports. This is also useful for labeling your windows with a title that is easy to remember and descriptive of what you are working on. 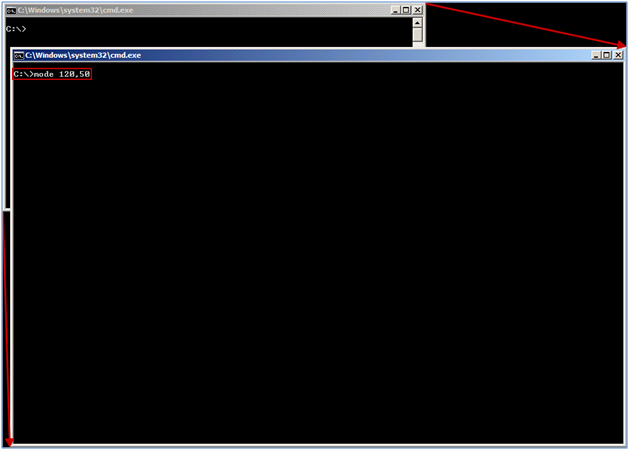 TITLE [string] string       Specifies the title for the command prompt window. findstr searches for strings in files [or anything else]. If you wanted grep in Windows, you got it. findstr has been present in Windows since XP and 2003. It accepts regular expressions and can search case insensitive (/I). One of our favorite ways to use this command is for filtering—especially long lists such as process listings and listening ports. Prefer WordPad over Notepad at times? Want to launch it from the command line, but you hate typing the full path (c:\Program Files\Windows NT\Accessories\wordpad.exe c:\Program Files (x86)\Windows NT\Accessories\wordpad.exe) to launch it? Ever wanted to dump the contents of a particular directory or structure to a text file? tree is the way to go—it is fast and recursive. The “/F” attribute will list the files in addition to the folders—leave it off and you just get the folders. "/A" is useful if you are sending output to a text file or other document. If you live in the command line and don’t want to spawn a graphical text editor to read a simple file, you can always “type” the file. This is similar to “cat” in *nix. If you need to read larger documents, it can be piped to more or just use more to read the file in the first place. "This is how you can read a text file from the command line"
Those are some of our favorite tricks to make Windows more convenient to use! Hopefully there was at least one trick here that is new for you. Do you have any tricks that amaze others? Share them in the comments below! Any way to show the PID of the actual cmd window it is running in? The second column is the pid. wmic process get name, executablepath, processID | find "cmd"
If you want to see a list of all processes, just remove "find" part (including pipe sign). Thanks for the awesome links and your work making volitility that much better. I will use this in class to explain a key concept. 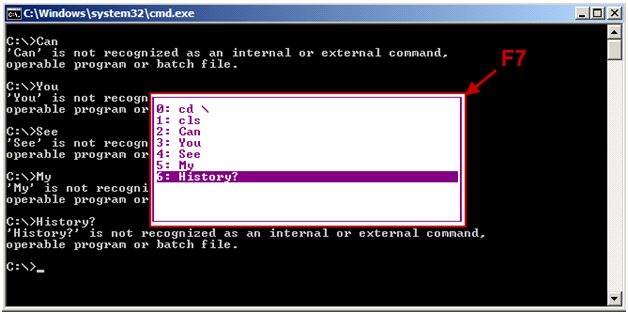 First, I usually remind students about nix's bash_history and then ask them this thought provoking question: "What file contains Windows command line history". Very few people know the answer. Thanks again for sharing. The feature I use most frequently on command line is the auto-completion [tab] key. On each computer I work on I change the properties of the windows to quck edit mode and set it to modify the link that starts cmd prompts. Since I am using my profile it does not interfere with others. I forget most of these but like to be reminded every once and a while. Nice tip John. 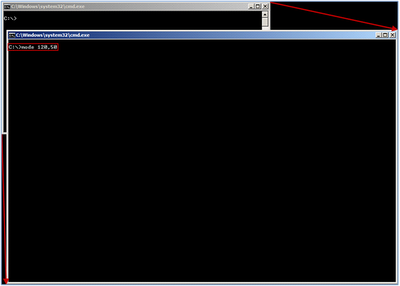 We create modified command prompt shortcuts for our class images. It prevents us from having to change the background color and adjust the font size each time we spawn a shell (which happens a lot in a Foundstone class). A real life saver when you have to project something that is legible to a whole class. That is a lot of fu, sir. Well done and thanks for sharing.